Class was canceled at Fortuna High School yesterday after the Fortuna Police Department received a report that a student planned to bring a weapon to campus and possibly "engage in acts of violence." The report turned out to be false, but as the press release below reports, some Fortuna High students reacted by suggesting they should arm themselves and head off to school. 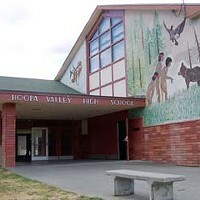 On December 20, 2012, the Fortuna Police Department received information that a student was planning on bringing a weapon to the Fortuna Union High School campus to possibly engage in acts of violence. Upon receiving this information, the department met with high school and district administration and began working together to ensure the safety of students and staff. To ensure student safety, Fortuna High School administration and Fortuna Police Department determined that canceling class at the high school today was the safest option and would give officials adequate time to conduct a thorough investigation. The Fortuna Police Department and high school administrators worked late into the night to complete a thorough investigation and determined that the information was false. Through the course of the investigation, it was determined that other students had also became aware of this information and were discussing bringing weapons to school for self-protection should an incident occur on campus. "Throughout this investigation, the safety of student and staff was the first priority of both the department and the school," said Sergeant Charles Ellebrecht. "Together, we decided that canceling class was the best option." Despite recent events, schools are one of the safest places kids can be. The Fortuna Police Department works closely with all schools, public and private, within our city to enhance safety for students and staff. Each school is required to have a School Safety Plan specific to that campus that addresses most types of incidents. Officers train for a variety of emergencies in strong partnerships with school staff, who are dedicated to the education and safety of children. There are procedures in place, such as shelter in place, evacuations, and lockdowns that can be implemented depending on the given situation.